New Consultants please be aware of scams such as this one below. If they do not use debit or credit cards, please do not accept the order. How are you doing today ? I need you to place an Order for me and also want to be your new Customer, My Boss would mail you Check for the amount of the PAMPERED CHEF, the shipping fee and the tax as well since i don't operate CREDIT CARD and am a DEAF MAN. The table below illustrate my Order. The Check MUST arrive before placing my Order . Note:- Are the products all hand wrapped? I would like to send the payment in advance so you can start ordering, but let me know how much the total amount for the order would cost me including shipping. Payment is in the form of a certified bank check. More so I do not have much knowledge about computer / internet and have no credit or debit card to do the orders on line myself, but I was told I could order through a sales consultant. Please return to me with the total amount ..
Once I have the total amount and your postal address to which the payment is to be sent. I will ask my financier to send your payment as soon as possible. Below is her address to which the product will be sent. Keep in touch .Below is out family house address where the product will be sent to and that is where the wedding will be holding. Keep in touch . National Conference Registration begins on April 8th!!! Please save a little each month and join us this year! Brush the pan with 1 tbsp of un-sweetened cocoa powder (or 1 tbsp of the dry cake mix) and 1 tbsp of oil mixed together. Mix the ingredients well (batter will be thick) and bake about 20 minutes at 375 degrees until springs back to touch. Do not over cook cake. Cool five minutes and turn out onto cooling rack. Sprinkle with powder sugar. Notes from Breakout Sessions...coming soon! What to do in Chicago while you attend National Conference? 1. Be among the first to see the new FALL Products! 2. Get motivated like you have never been before! 3. Celebrate your accomplishments and those of your team members. 4. Get knowledge, tips, and great tools to strengthen your business. 5. Meet top consultants from all around the country—learn their tips! 6. Hear amazing motivational speakers-the very best! 7. Get “pampered” with wonderful food, gifts, and FUN! 8. Meet fellow team members and make life-long friends! 9. You get to see CHICAGO…one of our nation’s most FUN cities! 10. Be rewarded for all you do for this company. They truly pampered you with gifts, great food, and amazing fun! Won’t you join our team for National Conference August 3-5, 2017? We need you and YOU need Conference! you will NOT regret it!! I promise! Playback number: 712-432-3131 - Access Code: 18435887. "Check names off your Gift List with brand new products"
Create sales on your personal website by sending a Customer Connection email (see attached suggestion), and let them know to click "Holiday" in the menu bar for great gifting ideas. You need to check them out -- they are amazing! Here is a video, showing how I am teaching my team to recruit, using the website, instead of the interview cards. I hope it is helpful to you and your teams! How any consultant can use our website tools to recruit....be sure to ask the CLOSING question, "Are you ready to click on get started?" at the end of the interview. Daily 5 Challenge in on!!! When planting seeds…it takes time. Pampered Chef is hosting a Cyber Monday Sale on November 30th from 12:01 am to 11:59 pm (CST) with free shipping for online orders over $75. Get free shipping on online orders of $75 or more (before tax and after other discounts). Taxes and prior purchases will not count toward the minimum purchase requirement. Show orders will not qualify. When you qualify for free shipping, you will also qualify for the November guest special. Double win!!! Free standard shipping on online orders will be available to customers in all 50 states, as well as those with APO/FPO addresses. Line the bottom of the pie crust with parchment paper and pour in some rice. Bake your pie crust, and it'll still hold its shape, some of the butter from the crust will seep through the paper and get into the rice. You can then cook the toasted rice into a delicious, buttery rice pilaf. Stuff your stocking with great-tasting gifts! In November: When guests purchase any of 10 select pantry rubs or seasoning mixes, they'll get a second one free! In November and December: For a limited time only, the Bamboo Serving Set is just $3 (save $6.50)—stock up for holiday entertaining and gift giving! You asked for it, you got it! Join us on Mondays from 8-8:30 p.m. (CT) for Tips from the Top! Each week a top field leader will share tips on a variety of topics to help you end 2015 strong! The conference dial-in number is 712-770-4005, participant access code: 427286. The calls will be recorded and available for one week following the call. The playback number is 712-770-4009. Connie Florer was mentioned in PC Fresh News on October 27th!!! It was MAGIC!!! Share this video on your Facebook Page! Having so much fun in the kitchen!!! Happy Birthday Deena! from the All Star Team! Fabulous product!!!!!! Order it via my site at www.pamperedchef.biz/pamgarner OR get it free by hosting a show!!!!! Small and large Pampered chef's Boil Over No More. Use them to keep your stove top spotless by preventing boil overs and splatters. Turn them over and put the insert on the opposite side and use it for the microwave as a splatter guard. You can earn all the May 2015 Help Whip Cancer® products FREE when you submit 2 Shows March 1-31, 2015. Davina Messics did a training call today for my team on how to maximize Fundraisers. It's incredible!! Share this with your teams!! If they implement what she shares, they will have an incredible 2015. Did you know Davina sells over $30,000 a year in Fundraisers and ALWAYS earns the TOP LEVEL Incentive trip? She is a Rockstar!! Love letter #1: Austin. Even though I don’t live here now, this city means a lot to me. It’s one of the first great loves of my life. It’s where I came of age, where I learned to be a young man. It’s where I learned some simple values, like the importance of handshakes and speaking plainly. It’s where I learned the power of music authentically expressed, like the cry of a steel guitar, or cowboy songs around a campfire late at night. It’s where I learned to dream. I still remember going with friends to Enchanted Rock one time, and counting over 30 shooting stars while lying on our backs. It was like we were on the prow of Spaceship Earth. We had the whole world below us, as we hurtled forward into the universe above us. I still remember moving to Austin as a teenager, and realizing that I’d never tasted such a place before. Austin has a flavor that is unique. It lingers in the soul. It wasn’t until I grew up that I realized how special and rare that flavor is in the world. A full generation has passed since that time, and things change. Austin has boomed. And Austinites can be rather nostalgic these days. One generation ago, Whole Foods was a “small neighborhood grocery.” Those are the words from the corporate website. Today, there are over 360 such “small neighborhood groceries” around the world. One generation ago, South by Southwest was a bracelet you bought to go barhopping and hear local bands play. Today, multinational corporations sponsor events at “South By” to market new products to millions of consumers. One generation ago, when I talked with people outside the state of Texas, Austin was often confused with Houston. Now, Houston is sometimes confused with Austin. Sorry, Houstonians. Here’s what I’ve come to realize. Austin was special because it was at the edge of the frontier. Not just the geographical frontier. It was at the edge of cultural frontiers, a collision of different ways of living. The mashup of cowboys, hippies, intellectuals, and civic leaders created its own music that still echoes in the hills today. And each of those components played a role. Gritty bluntness from the cowboys. Open-heartedness from the hippies. Love of ideas from the academics. Grand ambition from the civic leaders. Those were the lines of code in the original operating system of Austin. That software program simply ran its course over several decades. One generation later, and I can still taste that Austin. The flavor will remain on my tastebuds until I die. Here’s the takeaway lesson. There is a natural power at the edges of frontiers. When you go fishing, the best places to drop your line are at the transition points, where light meets dark, shallow meets deep, fast meets slow. The same is true for human life. When you go searching for your fortune in life, look for those transition points. That’s the frontier. That was Austin. Turn old catalogs into gift bags! THANK YOU Sizzle 2014 for the www.tinyurl.com tip!! Now I can say "You can place an order at www.tinyurl.com/JanesShow" instead of "I'll have to send you the link" when a guest asks about placing an outside order. So much more productive!! Just one of dozens of great tips I picked up and implemented immediately. LOVED this time at conference! Recruiting interview with Chandra Law- 15 New Recruits since January! What paperwork do you give interested perspective consultant? What kind of excuses/ objectives have you in countered? What do you say or do? -every one imaginable ;) Too busy, don't know anyone, no good at parties, etc. I answer them the same way I would answer a host who is objecting to a party--help give them the confidence to know they can do this too! When and how do you train? -varies. when I sign several all at once, I try to set up a new consultant training with everyone at once (in Feb I had one where there were 6 there), otherwise I do a one on one with them. Your thoughts on launching shows and strong starts? -I would love to go to launching shows to help but my schedule prohibits it. I do know those with the stronger start are more consistent and have more fun & success with their businesses. When and how do you bring up joining u in the business with hostess? -during my host coaching. I usually say something like "You & your friends obviously love pc, have you ever considered doing something like this? We could make your party your kickoff party or if you haven't quite decided by that date we can use some of your free product towards your kit!" What do you say at the show/ outside of the show? -I try to emphasize that really anyone can give this a try for just $99. No other investment needed after that, first you truly get to see if you like it before you spend another dollar out of your pocket! When do you say it during your show? -I don't bring up the opportunity during a specific time during my party, just often. Do you use the booking slide? What recipes are you making at your shows? Do you tie any statements with products from the kit? Does the trip have any impact on your recruiting? -I think it has. I have several who are really wanting to earn Disney, I think because they saw me do it they realize that they can do it too! Do you wear or carry logo items? -yes, my purse is the gray one we earned last year with the mini catalog in the front. I have a few logo shirts I wear as well, people always notice those and comment on how much they love pc! What changed from what you did in the past? -I can't say anything in particular has changed, Maybe because I realized that giving PC a try isn't a MAJOR decision. How many of us have spent more than $99 at Walmart and we don't even remember what we bought? Why not use that $99 to give something like pc a try and see what else it can do for you and your family? Do all your consultants qualify? -nope. I wish they did but at some point I feel like if they are going to qualify, they are going to qualify, does that make sense? I am here to help them & support them every step of the way but I don't stress out or pressure them too much. I always point out the benefits of qualifying (incentive, pc dollars, trip points, etc) and then the rest is up to them. Any tips on team recruiting? How do you balance bookings / shows and recruiting with your busy home life? -This is still something I'm working on, I tend to hyper-focus on one thing at a time (like February was recruiting, lol). I am still trying to achieve a good balance but the main thing I learned is that I can't do it all. Sounds silly but it's true. Do I get everything done for my team that I want to? Nope. Do I spend as much time on the phone as I want to? Nope. Is my house clean and weekly menu always made? Nope. You get the picture. I don't do as much on anything as I would like to but I have learned that it's ok. I do what I can. I prioritize and realize it's not the end of the world when my to-do list doesn't get totally done. -I can't think of anything that I haven't already covered right now, sorry! Anything else's you want to add? -I guess I would just say don't over-think it. Don't over-talk it. We are putting too much pressure on them and ourselves, I think our recruit leads are getting overwhelmed with everything. Shoot, if I go on consultant's corner and think I need to learn it all I get overwhelmed never mind thinking I need to teach everyone how to do it all! Show them what an awesome return they will get on their investment. $99 and a few parties and look how much they get! Why wouldn't they want to try it? 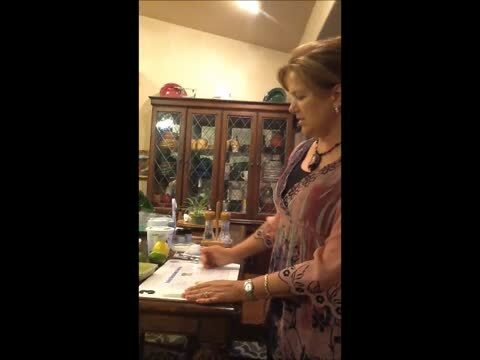 Lisa Vega testimony in Ontario, CA! Kelly Bjorklund Church "ROCKED THE HOUSE" IN Ontario, CA!! Thank you Kelly for your expertise! "There are three types of people at this show today... those who love to spend money, those who love to save money, and those who love to make money. For those who like to spend money, just bring up your sales receipt and I will help you spend all your money. For those who love to save money, host a show and you can earn free, discounted and half price products! And those of you who like to make money are like me, and have I got the job for you!" Use this Makeup bag from 31 gifts to help you organize your full service checkout! Taste Testing Invite- host your own show and come taste the newest recipes out of the Season's Best! 2-24: Sample fundraiser order form photo on the Fundraiser page, Product Spring Summer 2015 List posted on Important Documents on Home Page. 1-28 Removed Dinner Done Documents. If you would like information, please request to become a member on Face Book. a new meeting idea has been uploaded called "Minute to Win It"
Products!! Be the first to see NEW PRODUCTS and learn how to use them to increase Bookings & Sales. Celebrate a table full of Achievements.